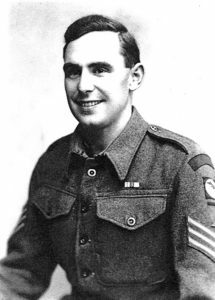 Editor’s Note: Neville Howell was born in Great Yarmouth in 1922 and enlisted in the Royal Artillery as a boy soldier in 1937. In 1941 he joined the 73rd Anti-Tank Regiment, Royal Artillery. It was equipped first with 2-pounder, then with 6-pounder, anti-tank guns. Now a sergeant, he arrived in Egypt in July 1942, and took part in the battles of Alam Halfa and El Alamein, the advance to Tunis and the invasion of Sicily. The 73rd Anti-Tank Regiment, RA, which was the anti-tank regiment of 30 Corps, returned to England, to Felixstowe, at the end of 1943. Shortly afterwards Sergeant Howell was posted to another battery, 234 Battery (H Troop). It was re-equipping with American M10 Tank Destroyers: four to a troop, with three troops in a battery. In May 1944 they were loaded onto transporters and taken south to a camp in the Winchester area. On the evening of Saturday, 3 June 1944, the whole battery was on the move and we knew this was not a practice run. It was a cold dull evening, with a touch of light drizzle, as we made our way to the docks in Southampton. Sometime during the night we loaded onto tank landing craft, only two M10s to each landing craft, where we joined a small mix of vehicles from other units – a total of about 8 or 10 vehicles to each landing craft. Early Sunday morning, my troop commander, Lieutenant Cook, boarded our landing craft to show us some photographs of the exact beach we would be landing on in France. He also gave us a small amount of service issue French money. I was given maps of the landing area and adjacent countryside, together with a small florescent yellow recognition panel with attached tying tapes. The panels were issued, about one to every seven infantrymen for wearing on their backpacks, and for vehicles to display in a prominent position. The purpose of the panels was so that ‘friendly’ aircraft, in the first few hours after the landing, would have an idea of where the most forward troops were positioned. The troop commander (we wouldn’t see him again until we were on French soil) informed us, before returning to his own landing craft, that a religious service was taking place further along the quay later, and we were all free to attend, but I don’t think anyone from our landing craft went. I asked one of the few crew members on board the whereabouts of the captain, since I hadn’t seen any sign of him. He answered that he was with his mates, and indicated they were drinking. Much later, with the captain on board, we moved away from the quayside, and joined the multitude of other craft at anchor off the Isle of Wight. The weather was still bad, cold with a heavy overcast sky, and now with the craft in more open water, I just hoped I wouldn’t be sea-sick. On the evening of 5 June, we moved off in convoy, surrounded, at no great distance, by columns of other craft. We knew we were in for an uncomfortable night, as there were no sleeping quarters for us on board; but we had been issued, from the craft’s stores, with blankets sewn to a wedge shape like a sleeping bag. During the night my crew and I took it in turns sitting in the seats of the driver and wireless operator in an attempt to doze. At times in the darkness, we could, above the sound of the sea and landing craft, hear the roar of aircraft engines passing above us. Soon after the first light of dawn, we could see that we appeared to be leading our own small convoy. We had been told that the final part of our passage to GOLD beach would be marked by coloured buoys, dropped by destroyers, and we were obviously following the wrong coloured marker-buoys. As it grew light the still distant shore came into view. Away to our right there was a lot of activity with battleships and special rocket craft blasting away. I glanced at my watch. It was twenty-three minutes past 7am. Straight ahead on the shoreline were a few landing craft, but we were heading, flat out, for the empty beach to our left. At sometime during our time on board, the captain had promised us a dry landing. I think his promise was fuelled by drink and I think he had continued drinking through this last night. Anyhow we headed full pelt for the beach, and the erected beach defences, which were plain to see. That type of beach defences were, I believe, called hedgehogs, lengths of railway line stuck in the sand with a mine or couple of shells on top. We hit the shore hard, and there was a big bang, followed by an ironic cheer from a few of us who had seen it coming. We began drifting seawards again, with flooded engine room and damaged landing ramp. The seawards drift was halted and the damaged ramp lowered, but we were too far out to land. We watched as other craft came in to the beach: some were small assault craft with perhaps six or seven men on board, and some were blown to bits. We managed to pull some of the unconscious occupants out of the water by using a boat hook. One of them was a Royal Marine captain, and I remember our captain shouting from the bridge to take him below and give him some rum. The area was being shelled intermittently, and a few other bits were splashing in the water, but I would say that on our part of the shore, things were not that bad. We watched as other landing craft unloaded. Some of the vehicles leaving them were swamped. One comical sight was a swamped lorry with a couple of lads sitting on top of the cab, drinking from a bottle and looking as if they intended to stay there until the tide receded. It was some time after first touching land that the skipper managed, using the loudhailer, to persuade another craft to nudge us nearer the shore, and enable us to unload. The bottom of the ramp was still beneath about five feet of water and I watched as a couple of tanks made it to the beach OK, then it was our turn. Somehow a jeep, under the control of a captain (I think he was a medical officer) squeezed onto the ramp just in front of us. The jeep, almost submerged, came to a halt at the bottom of the ramp. The captain stood, up to his chest in the water, waving to me to halt our descent down the ramp, but I ordered my driver to proceed and the jeep was pushed gently to one side. We had no trouble getting off the beach, which, because of the rising tide, had narrowed to a thin strip of sand at this point, backed by a shallow bank of dune. Other parts of our battery, including the remaining vehicles of our troop, were already ditching what they could of the materials used during water-proofing when we joined them just off the beach, and we learned that we had been landed well to the left of where we should have been. We soon moved off in a column of vehicles, climbing a slope of land running parallel to the sea. About halfway up our column halted and I dismounted to attend to the wants of nature. I heard the boom of a heavy gun and the sound of a shell coming our way. I turned to remount just as the shell, a dud (or I wouldn’t be writing this) landed a yard away. I was splattered with earth as the shell left a steaming hole where it had buried itself. My crew, and the troop sergeant, Sergeant Kitchen, who was travelling on my M10, found it rather amusing. The column continued, and we came to a halt again about a mile or so inland from where we should have landed. We were stopped beside a gate surrounding part of a large garden and two elderly ladies came to talk to us, while from the direction of the sea came the sounds of a heavy battle. Our landing on the wrong part of the beach had given us a fairly easy landing. After a couple of minutes one of the ladies told us there was a German soldier in the large shed in the garden and would it be safe for him to come out now. I assured her he would not be harmed, and to tell him to come out. He came with arms raised, and on our side of the gate I motioned him to lower his arms. As soldiers go, he was an old man, and he had tears in his eyes as he tried to interest me in family photos he took from his pocket. There was a narrow road leading in the direction of the sea, and I pointed down the road for him to go. After a quick farewell to the ladies he went, with a look of disbelief, that so soon after becoming a prisoner, he was set on his way alone. Soon after there was a crash as someone took the top off the church, which tumbled down onto the road somewhere about where the German would have been. I’ve often wondered if he made it to the beach. The time would have been mid-morning, about 10am. Our column continued its advance inland. There were a few hold-ups from minor skirmishes, just up ahead, but they were only temporary. From about midday we enjoyed some warm sunshine, much better weather than for the previous few days. The evening saw our column halted about five miles inland. The troop commander ordered that I take up position for the night, on top of a high ridge of ground. Near the spot I chose was a dead German, but no other signs of battle. Looking down from the ridge, all the vehicles had pulled either side of the narrow road we had been following. As dusk was falling, a German armoured car, which had remained hidden in our rear, came belting up the road between all the vehicles and disappeared where the road entered a wood up ahead. It happened too quickly for anyone to do anything about it. That first night, for us, passed peacefully, the only noise coming from distant beaches under air attack. For the next four or five days my troop chased backwards and forwards along that part of the front between Bayeux and Caen, trying to catch up with an elusive enemy, and I relate briefly two incidents we were involved in then. We arrived at the end of a lane, from which one of the other troops from the battery had returned with a number of prisoners. My troop commander joined me in the turret and we led off, the other three M10s of the troop strung out behind, to see if we could take a few prisoners in the lane. After travelling about 300 yards we stopped just short of a farm complex. The lane was bordered by typical Normandy hedgerows, thick and tall, sitting on a strong earthen bank. The troop commander and I agreed it was too risky to go any further. We then spotted a figure run from the farmhouse to a barn and disappear into its darkness, where we could see a horse moving about. Out of the turret, and standing on the engine cover plates, I used the machine gun mounted on the turret rear to fire single shots into the barn, taking care not to hit the horse. After a few shots, the figure in uniform and equipment came out of the barn, running away across a field. I continued firing single shots over his head and in the middle of the field he dropped down and lay still – playing dead? But I knew I hadn’t hit him, I hadn’t tried, so I put a few more single rounds near him and he was soon on his feet and running again. On the far side of the field he reached some bushes and I stopped firing. It was his lucky day that I just chose to scare him. Another time the troop commander called the troop sergeants to a meeting. He gave us the map references of a wood, some five miles away, which we were to attack with infantry who were nearby, and could we give them a lift to save them from having to march there. Of course we agreed, and we set off with around eight infantrymen each, carried on our M10s. I had two in the turret and the remainder on the engine covers at the back, clinging on as best they could. Since there was no clear established front line as such in that area, I warned the infantrymen that if we bumped into trouble on the way, they would have to get clear of the M10 immediately. We reached that part of the road from where the attack was to be launched without any problems, and as soon as the infantry were ready we set off together for the wood, about 150 yards across a field. Luckily for those infantrymen, who were obviously short of battle experience, we reached and occupied the wood without any sign of the enemy. These two examples are an indication of our activities on our part of the front during the first few days, when the main danger seemed to come from the occasional enemy sniper. The snipers, often positioned in trees, were active throughout the Normandy campaign, and because of our open top turrets, we felt particularly vulnerable. Snipers, if caught, were usually executed immediately. I think they were aware of what their fate would be. I witnessed it once. After the first few days enemy resistance stiffened, and we found ourselves taking part in attacks and coming under fire from shells, mortars, rockets and small arms, day after day. Those days were long and tiring, from before first light to late evening when, circumstances permitting, we might ‘pull back’ a short distance to replenish fuel, etc. We considered ourselves lucky if perhaps by 10pm the whole troop was together in a field, a few hundred yards behind the front line, allowing lookout duties to be shared. There would still be shelling or noise from our own artillery shells passing overhead, something most of us were used to anyway. In the desert, where the terrain was totally different from what we were now experiencing, the guns of the battery were usually deployed in the same area. Now, with M10s, each troop of the battery worked independently, and because of the thick hedgerows and trees, each M10 could be out of sight of the others in the troop when advancing during an attack, or consolidating the defence of newly won ground. As the 30 Corps’ anti-tank regiment, we were on call to support any of the divisions and units in the corps as and when required. In Normandy we were often called on, at short notice, to give support to units in different parts of the line, as often as three times in a day. Sometimes we were rushed to block part of the line, where no other troops were available. Maintaining the nightly lookout, which in dodgy situations meant two out of the five man crew keeping watch, plus the nights when there was no sleep for anyone, led to us all becoming extremely tired, and that’s putting it mildly. Even so, the poor bloody infantry (the PBI) were by far, much worse off. We could at least carry with us much of what we needed to provide limited comfort, but the PBI, often looking utterly exhausted from recent effort and lack of sleep, would find themselves being urged forward again, to attack and capture another piece of ground, carrying with them equipment and arms, sufficient for attack and defence only, perhaps in pouring rain and soaked to the skin, not knowing when they would next get a meal or hot drink or the chance to blot out their misery by snatching some sleep. I don’t think anyone, ships crew, aircrew or tank crew, having seen what the PBI endured in action, would have chosen to swap places with them. Some of the infantry units we got to know quite well – like those of the 43rd Wessex Division, particularly the Wiltshires. We supported them in action many times, and we were told that they specifically asked for our support, because we stayed close to them during an attack, and usually remained with them until the newly won ground was safely consolidated. When in position with them, we would tend to lend them our spade to help with digging their trenches – their own little entrenching tools were not so effective. If we made tea, we gladly shared it with the infantry lads near us. On a couple of occasions, while on the start line, waiting for the usual preliminary artillery barrage before advancing, we were joined by some of the infantry lads in a quick game of cards. I think we all realised it was a ploy, a show of false nonchalance to help divert our minds from what the immediate future might hold for us. No words of mine can adequately describe the full horror of life for the PBI during those weeks of continuous battle in Normandy, and, of course, battles elsewhere – life that for so many of them was extremely short-lived.